The sweet cherry flavor will envelope your senses with a single inhale. Fruity with just a hint of tartness, these cartomizers will refresh your taste buds and quench your nicotine cravings. 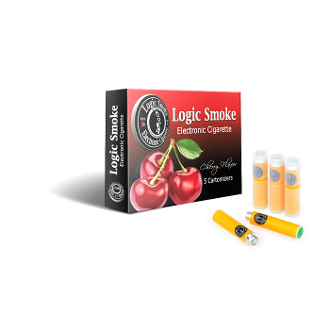 LogicSmoke new line of Cartomizers are using the traditional 510 threading, The logicsmoke Catromizer come with a pliable soft mouth piece for comfort on your lips and a realistic feel. All cartomizers are enhanced with the use of organic cotton inside of the cartomizer. Available in 11mg or 16mg of nicotine at the user's choice. The 11mgs will offer a nice medium hit of strength, while the 16mgs will give the user a bit of a deeper throat hit.